Figure 1 (A) The membrane-proximal phosphatase domain, D1, of RPTPa forms an inhibited dimer in which the active site of one monomer is sterically occluded by a wedge region of its dimer partner; perhaps serine phosphorylation in the juxtamembrane region serves to regulate dimer formation. (B) The C-terminus of RPTPa is tyrosine phosphorylated, allowing binding of the SH2-domain-containing protein Grb-2. This binding does not result in the recruitment of associated factors but may mask the site to inhibit binding of the SH2 domain of cSRC. Under the proper conditions, cSRC can bind the pTyr C-terminus, allowing RPTPa to dephosphorylate and activate cSRC. exhibits a variety of phenotypes, including polyclonal lymphocyte activation consistent with an increase in cellular CD45 activity . 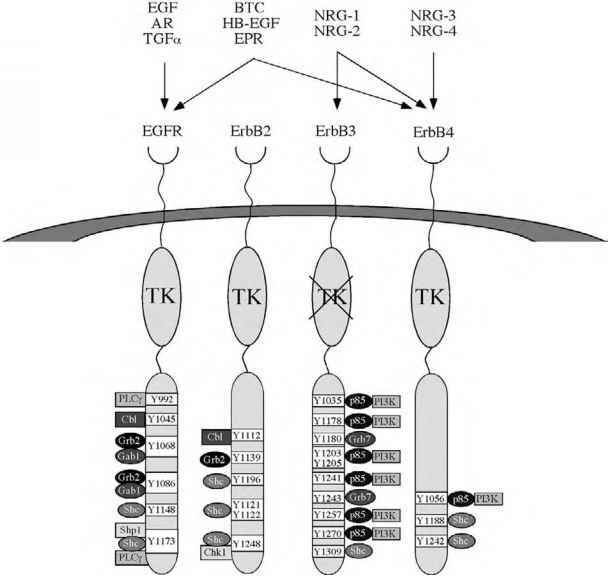 The dimerization model for RPTP regulation may not be a universal mechanism employed by all RPTPs. The crystal structures of the membrane-proximal phosphatase domain of RPTP^ and the tandem phosphatase domains of LAR failed to show dimer formation through the inhibitory wedge region [7,8]. Nevertheless, both structures contained an intact wedge that is not shared with cytosolic PTPs. It is important to note that the constructs used to crystallize both RPTP^ and LAR did not contain the transmembrane region that Tertoolen et al. demonstrated is sufficient for dimer formation in RPTPa . It is unlikely that the wedge region provides sufficient binding energy to drive dimerization of RPTPa in vivo; therefore, additional regions such as the transmembrane segment are likely important for dimer formation [8A].